Unique Russian-made engraved weapons fit for a queen - or king! Masters use even techniques of 19 century in their work. If you decide to go traveling and searching for gold in Russia, we know a hidden place where even arms are made out of noble metals. 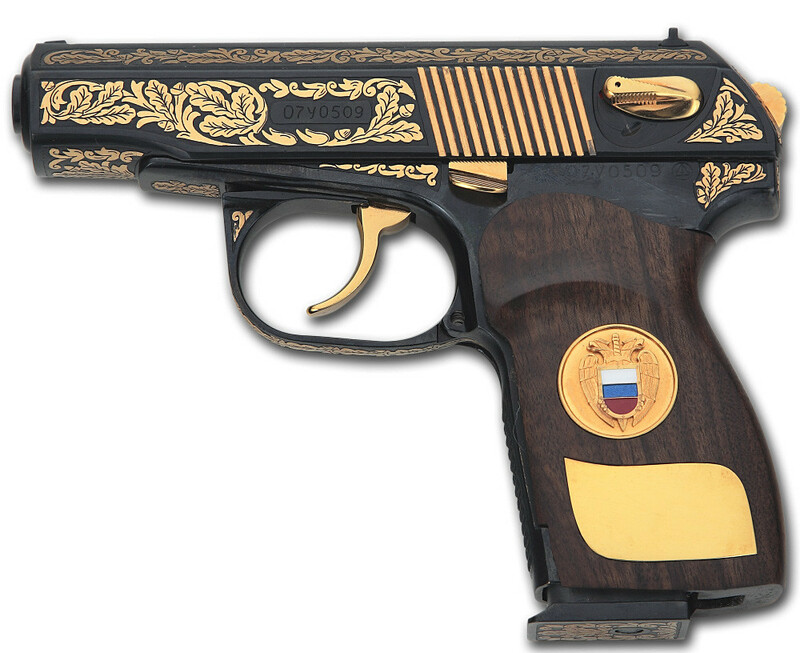 Russia is not only famous for its brilliant firearms manufacturers and scientists, but is also full of masters that can adorn your house with… golden rifles. Praktika workshop was founded in 1991 immediately after the collapse of the Soviet Union in the small town of Zlatoust (the name comes from the Russian word for "gold") over 1,000 miles east of Moscow. Praktika specializes in the decoration of cold steel arms. It also engraves canes, inkstands, Eucharistic sets, cabinet knives, dishes, trays, goblets, sets of wine and cognac glasses etc. Basically, a full set of Medieval and Modern arms and interior items. According to an official statement, each edged weapon is custom made from the best hand-made Damascus steel. The company’s blacksmiths and artists also use rare types of wood, mammoth bone, brass, bronze, stag horns, stones and other materials alongside such noble metals as gold and silver. 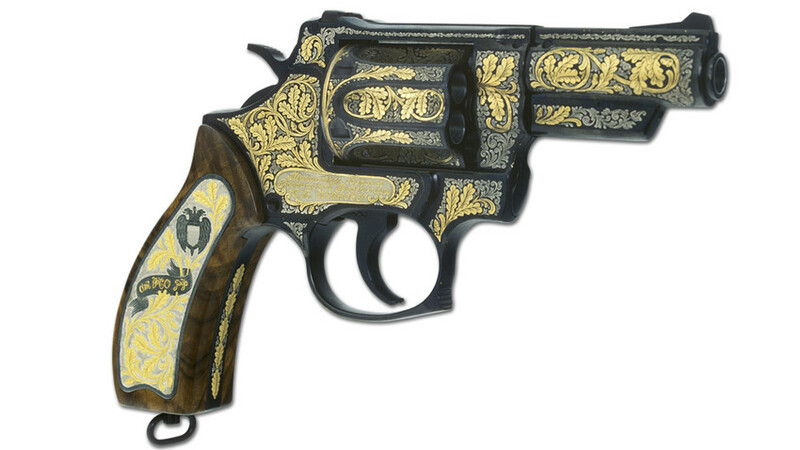 The company's craftsmen have revived 19th century traditions of discharging and gold plating in the ornaments and battle scene miniatures they engrave on firearms as well as on the cold arms. According to the company’s website, weapons made by its craftsmen can be found in castles of Queen Elizabeth the Second and the King of Jordan. 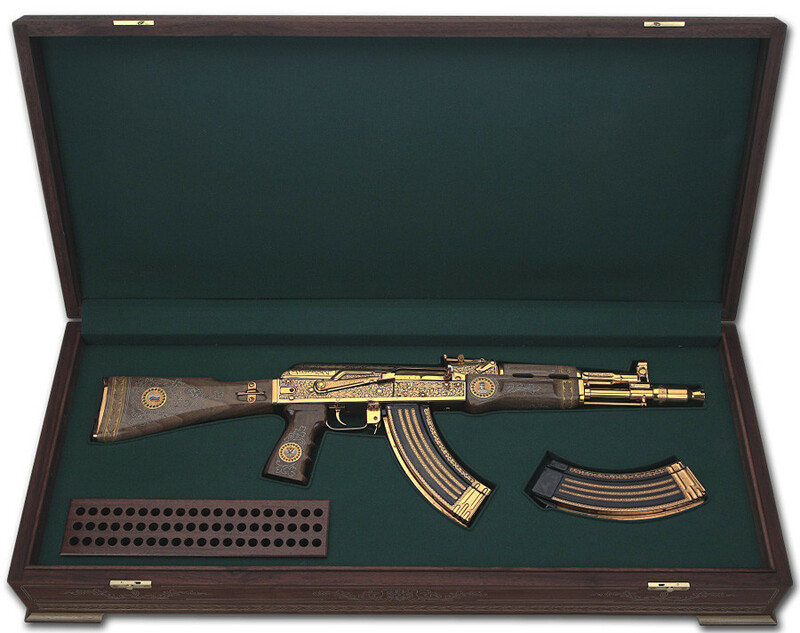 If you decide to visit Russia you’ll be able to buy a golden Saiga MK-03 (the civilian version of the famous AK-104) for around $50,000.